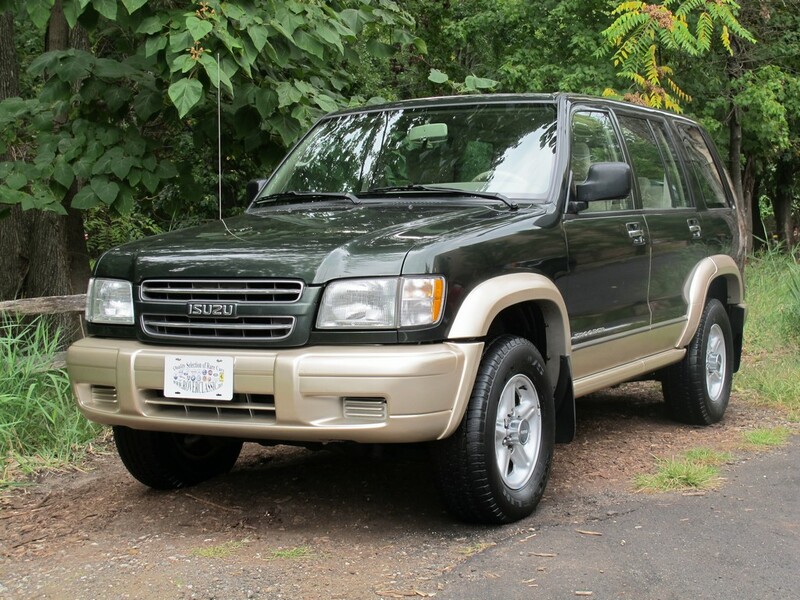 2000 ISUZU TROOPER S 4X4 ... 69,053 Original Miles Engine : 6 Cyl, 3.5L Transmission : Manual 4X4 Vin : JACDJ58X5Y7J18317 Exterior : Green Interior : Tan Body Style : SUV This One Owner SUV comes to us from Maryland. It has 5 Speed Manual Gear Box, Air Bags, ABS, Power Brakes, Power windows, Power door locks, Tape / AM / FM, Heated Mirrors, Cargo Cover and Air Conditioning. Engine is in Good Shape, does not smoke, does not leak, nice and quiet. Manual Gear box eels Perfect, shifts without any problems, without delay, and without noise. Clutch feels like New Suspension is in Excellent shape, Car tracks nice and straight. There is No Evidence of any Electrical problems. The exterior is in Excellent shape for a 2000. ( !!! Check out the pictures !!! ). The paint looks original with absolutely no rust anywhere on the car. Cloth Seats, Carpet Floor and Glass are all in Great shape ( !!! Check out the pictures !!! ) Interior of this car is Nice and Clean ( !!! Check out the pictures !!! ). This SUV has 4 matching Tires (90% tread), that are mounted on Good straight rims. Our mechanics have performed basic maintenance. We have also replaced Wheel Bearings, Brakes as well as Exhaust. It will be sold with a clear title and it will be sold as-is, where-is.